Between the apricots and cherries (sweets and tarts, mind you), the spring blossom season is a spectacular time to take an afternoon drive or bike ride. We’ve mapped out four Northern Michigan cherry blossom tour routes—from Traverse City and Leelanau County north to Antrim County. (Plus, restaurant recommendations along each route!) Cherries typically blossom in mid-May, but the unpredictable weather plays a major role—check MyNorth for updates or email us at info@mynorth.com. Start your cherry blossom vacation with this gorgeous aerial view of the blooms! Old Mission Peninsula is a premier agricultural area in Northern Michigan, and the heirloom orchards along M37—also known as Center Road—are breathtaking against the backdrop of West and East Grand Traverse Bay. Take a drive up M37 north from Traverse City and explore some of the less-well-traveled (but still paved) back roads on the 30-mile route. Along the way, stop by Jolly Pumpkin, Boathouse or Peninsula Grill for a bite to eat, and don’t forget about the peninsula’s award-winning wineries! 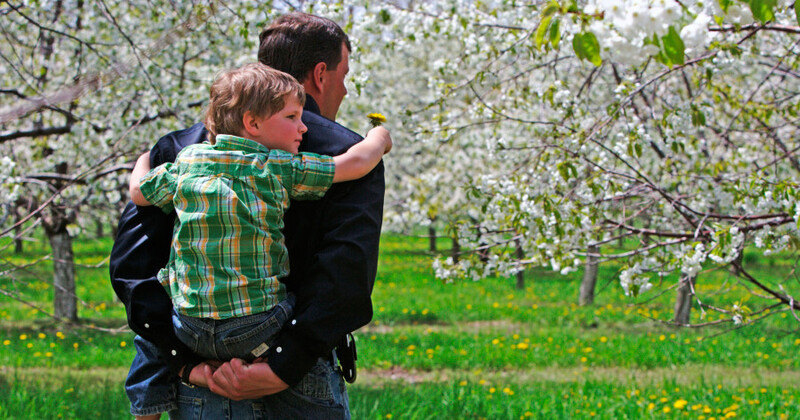 Celebrate Blossom Day on Old Mission Peninsula! Food and wine pairings along with other activities like winemaker chats and operations tours, Saturday, May 19, 2018. Filled with vineyards, hop-yards and cherry orchards, Leelanau County is a pastoral wonderland. The following route will lead you to some of the most scenic orchards near Lake Leelanau—with a lunch break at Fischer’s Happy Hour Tavern and a visit to Boathouse Winery and Northern Latitudes Distillery to cap off your trip. Your tummy and your camera’s memory card should be full after this 19-mile tour. Between US31 and Elk Lake sits acres—and we mean acres—of rolling cherry orchards. Take the following 14-mile circuit, which starts and ends in downtown Elk Rapids, to get the most bang for your buck this bloom season. Cyclists: try to stay off US31—it’s a busy, fast road. At Angell Road, double back on Monroe, turn right on Townline and return to Elk Rapids via Elk Lake Road. There are plenty of dining options once you get back to town: Siren Hall, Pearl’s New Orleans Kitchen and Riverwalk Grill and Taproom are a few of our favorites. Here’s another peek at the gorgeous scenery you’ll find along the way! The following 17-mile route takes you from Eastport to beautiful King Orchards, through Central Lake, and back along the northeastern edge of Torch Lake. Be sure to stop at Mammoth Distilling in downtown Central Lake to pick up a bottle of Cherry Bounce! Click the cover to read MyNorth’s Leelanau Vacation Guide!